Home | *Inspiration | Why in Islam is life a test? 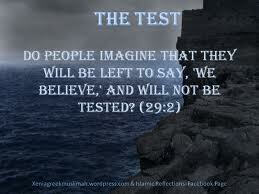 Why in Islam is life a test? 2,886 people read this post. For Muslims, now is a time of turmoil. Sometimes, it’s difficult not to feel despair. Everywhere we turn, we see Muslims suffering, struggling all over the world. Many of us are wondering, why is this happening to us? While all these thoughts are natural, we need to look beyond them. We need to look through the illusion for a moment, into the Reality that stands behind it. We must refocus our sight, if we are to see the Truth beyond this hologram. Everything in this life is a test. Here we are told that the very purpose for which life and death were created: to test us. Think for a moment about an emergency siren. What is its purpose? The siren is an indication and a warning that something harmful is coming. If we hear it, we naturally panic. But what happens when they need to test the siren? What happens when it’s just a drill to see how we will react? The test siren sounds exactly the same, but it is “only a test.” Although it looks, sounds, and feels real, it is not. It is only a test. And we’re reminded of that again and again throughout the test. This is exactly what Allah tells us about this life. It is going to look, sound, and feel very, very real. At times it’s going to scare us. At times it’s going to make us cry. At times it’s going to make us flee, instead of standing firm—even more firm—in our places. But this life and everything in it is only a test. It is not actually real. And like that test of the emergency broadcast system, it is training us for what is real. It is training us for the Reality beyond the test siren. So not only was the siren predicted – it was not new. Suppose our community was told that we are not unique. So after all of that, how then would we react once the test siren came? Well, if it’s a drill, there’s no shock or disbelief. We don’t panic. We don’t even become distressed. And here’s the crucial part. Who are we acting for? CNN, SABC, the public at large? No. They’re all a part of the illusion; all a part of the test. They’re all just a creation of the test. We act for one judge and one judge alone. We act for the only true Reality (al-Haqq). We act because we know He is watching, and He is the only One who will judge this test. “How should I react?” “How should I pass this test?” “What am I meant to learn?” “How should I see through this illusion, to the creator of the one who’s hurting me, the one who’s oppressing me, and the test itself?” “How can we as a community use this test to bring us closer to our final destination, God?” and “How can we use this test to fulfill the purpose for which it was created – a tool to bring us nearer to Him?” Allahu akbar (God is Great). Sabr (patience) and Taqwa (God-consciousness). Their response was not to look at the test. Their response was to look through it. They looked through the illusion and focused on the One behind it: God. They realized that, not only was Allah (swt) the giver of the test, He was the only one who could save them from it. And so they beseeched Him for His help through repentance, sabr, and perfecting their moral character (taqwa). Once we change our lens with which we see our lives, our internal and external response drastically changes. When the righteous before us were tested, it only increased them in faith and obedience. But until we change that lens, we will never move beyond “how could this happen to us” to realize the true purpose of the test itself: a created tool to purify, strengthen and bring us closer to the Creator of you, me and all governments.